Thank you for visiting our website. This is Captain Basil Yelverton (Capt. Baz), and it will be my pleasure to be your guide. First and foremost it is my goal to provide our anglers a safe, comfortable, and memorable day on the water. I grew up here and have fished these waters for over thirty years. This experience helps me decide where to go and what species to target based on wind and tidal conditions. I am always looking for comfortable, calm water fishing opportunities, and they are generally plentiful. It’s just hard to beat catching big fish in relatively flat water. Of all the types of fishing we do here my personal favorite is fly fishing. I was introduced to salt water fly fishing about twenty years ago and have become addicted. I'm not ashamed to admit it. I guess it is the challenge that turns me on. Take redfish fishing for example. It's great fun catching reds on live bait and top-water plugs, but catching one on a fly is just so much more challenging…especially when you are sight fishing. You have to spot a fish on the flats, sneak up close enough for a shot, cast the fly into the right position, and hope he’ll eat it. There are at least a million things that can, and generally do, go wrong, but when everything falls into place it’s very satisfying. Another excellent example is false albacore fishing. Most people around here call them bonito and catch them trolling to be used for snapper and triggerfish bait. To a fly caster they can easily become the main event…a prized catch. It’s electrifying to stand on the bow with an eight weight outfit in your hand drifting within casting range of a boiling, slashing school of false albacore. The first run takes you deep into your backing, and the fight has only begun. These fish fight so hard they will literally kill themselves trying to get away. It’s our job to bring them in fast enough to effect an unharmed release. I usually move up to a ten weight outfit to accomplish this even though these fish weigh only 4-8 pounds. When we find albies in shallow water, the experience is very similar to bonefishing in the Florida Keys. 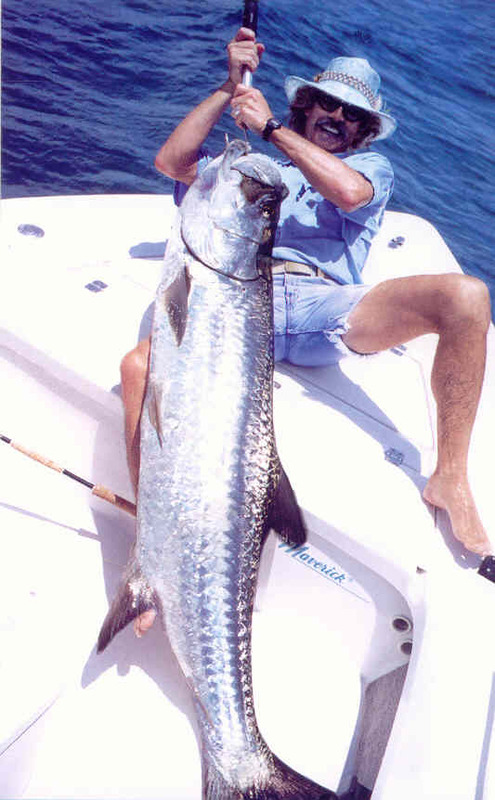 The last example is the biggest challenge of all …tarpon fishing. I have caught numerous tarpon on flies in the Keys and decided about fifteen years ago to try to catch one here. It is after all the “Greatest Show on Earth” to a fly caster, and we have a significant tarpon migration through our waters. Pier fishermen catch a few each year on live bait, but none to my knowledge had been caught on a fly rod until 2002. It took us eight years and countless hours on the water to put the puzzle together, but I finally hooked and caught two in one week. The larger fish measured around 125 pounds and appeared in Florida Sportsman. Although we no longer pull tarpon out of the water for photos, we made an exception in this case as you can see on the left. We took special care reviving this magnificent fish and were overjoyed to watch him swim away. When conditions are right and I have fly casters on board who are up for the challenge, we spend an hour or so tarpon fishing on all summer charters. I also enjoy light tackle and near-shore bottom fishing. Whether we are casting top water plugs for speckled trout and redfish, jigs for pompano, or spoons for Spanish mackerel and bluefish, it’s all great. Live bait fishing for king mackerel when the gulf is calm provides about as much excitement as a person can stand. And it’s hard to describe the thrill of a grouper or large red snapper taking a live bait around structure in fifty feet of water. You have to feel the power to believe it. It’s fun to mix it up on a given day and try different kinds of fishing until we find a favorite. Night charters add extra excitement to any fishing vacation. It’s particularly beautiful on the water at night especially when the moon is about full. In the warm months we fish around dock lights for trout and redfish. 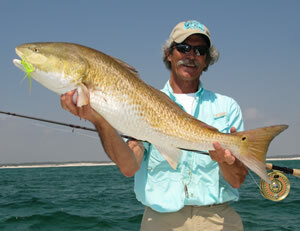 In the fall Pensacola Pass is the place to be for giant redfish. For extreme sports enthusiasts I have some huge cane poles that we use at night for these 20-30 pound brutes. For those anglers wanting to add elegance to our fishing day, we have numerous waterfront restaurants where we can stop for lunch before moving on to the afternoon’s opportunities. It’s amazing how a couple glasses of a nice merlot can tighten up a fly caster’s loop. The bottom line is that I love the waters we fish and take great pleasure introducing our visiting anglers to them. We have a little something to offer everyone here, and I enjoy guiding our anglers to the fishing adventure that’s right for them.